Preheat oven to 325°F. 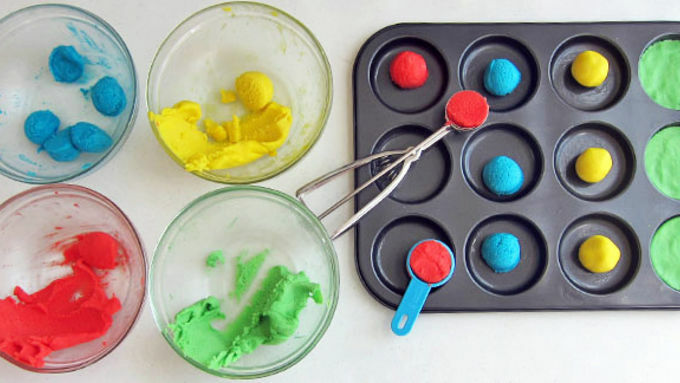 Spray a whoopie pie pan and two brownie pop molds with baking spray. Then mix cookie mix with flour, butter and egg. 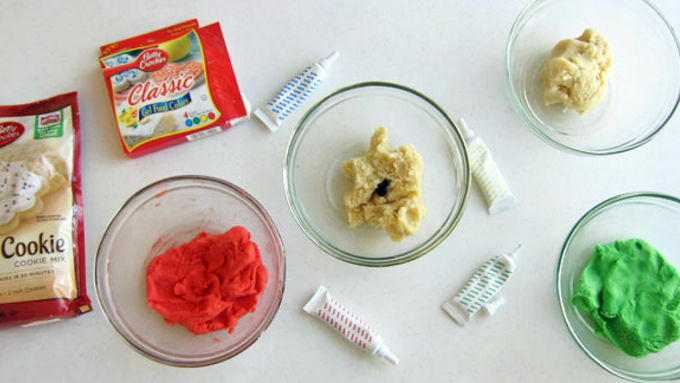 Divide dough into four equal parts. Color one part red, one yellow, one blue and one green. Bake for 10-12 minutes until golden brown around the edges. Allow to cool. Increase oven temperature to 350°F. 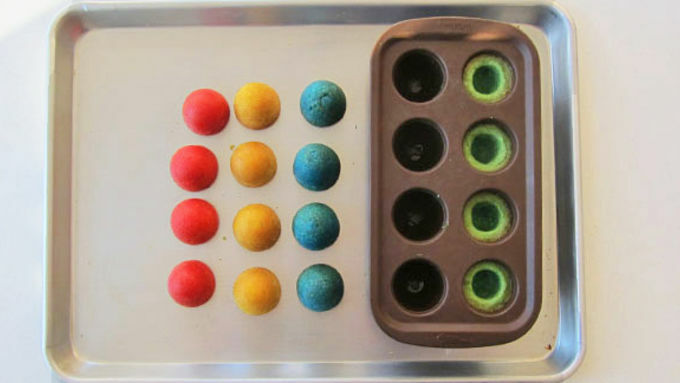 Press remaining dough balls into individual cavities in brownie pop silicone molds, making 4 hat crowns of each color. 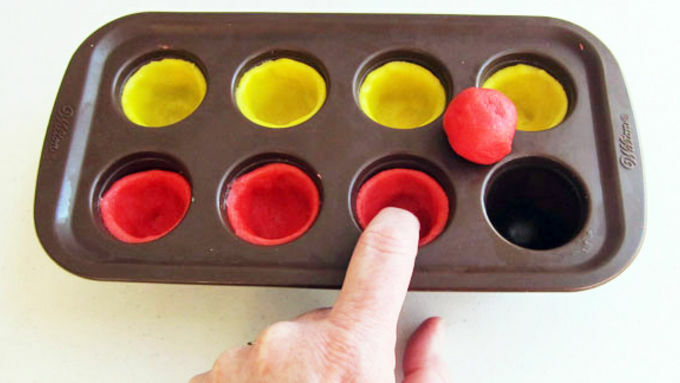 Use your finger to create a well in the center of each dough ball. Press the dough up the sides of the mold, up to the fill line, about 1/4 inch from the top of the mold. 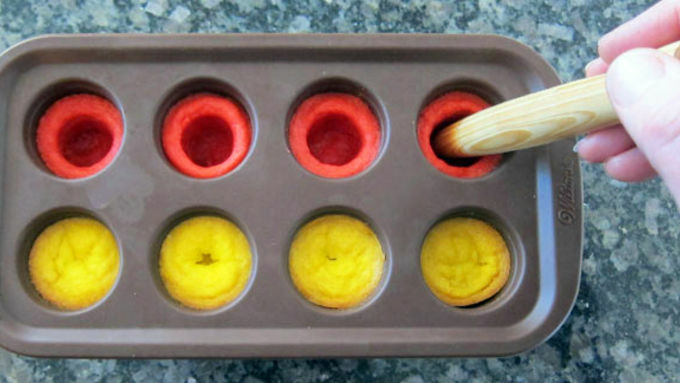 Freeze molds for 10 minutes, then bake for 14 minutes. Return to the oven for 4-8 minutes until cookies are baked through. Reshape if needed. 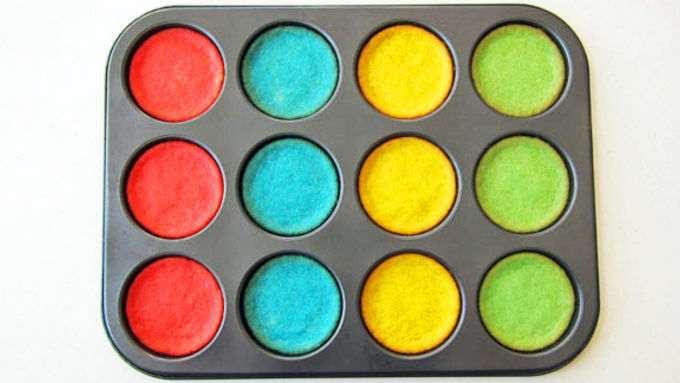 Allow to cool completely, then remove from mold. Pipe a line of cookie icing around the base of each cookie crown. Sprinkle on some non-pareils. Allow to dry. 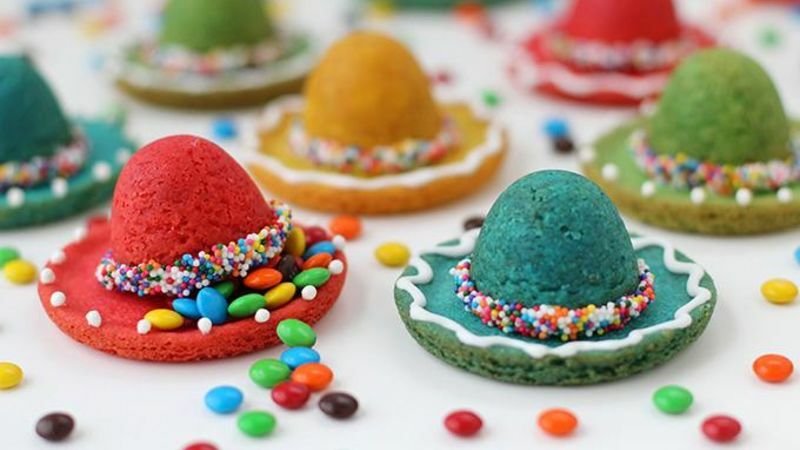 Turn cookie crowns upside down, fill with candies, pipe some icing around the top edge, and press a round cookie brim onto the cookie crown to create the sombrero. Turn cookies right side up to decorate. Use icing and sugar pearls to decorate the edges of the hat brims. 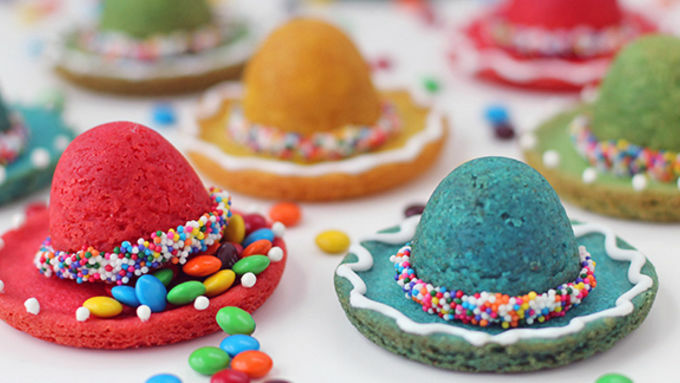 Adorable sombrero piñata cookies hide a special candy surprise inside! Crack them open to reveal a sweet treat! Last year I vacationed in sunny Mexico and aside from lounging by the pool, walking on the beach, and enjoying the cultural cuisine, I also got to partake in a fiesta. It was so much fun dancing to Mariachi music! Everyone at the party was given a brightly colored sombrero to wear. The hats created a sea of color and movement. I even bought a sombrero hat ornament to hang on my Christmas tree to remind me of our vacation. With Cinco de Mayo coming up I thought it would be fun to make some sombrero cookies to remember my fantastic time in Mexico. 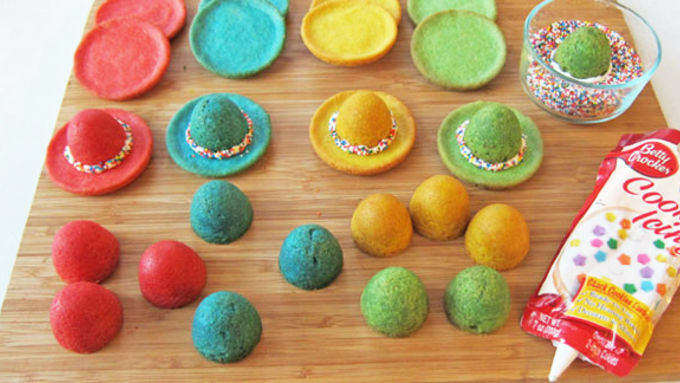 But these aren’t just any sombrero cookie – these are piñata sombrero cookies! Each cookie hat is filled with candy and can be broken open like a piñata to reveal the hidden treats. They're fun desserts to serve at a Mexican fiesta or on Cinco de Mayo. One of the tricks to perfecting these sombrero cookies is in shaping the crown of the hat. After the cookie dough bakes for 14 minutes, remove the cookies from the oven and rework the well in the middle of the cookies. The dough will have puffed up and filled in the opening, so you need to push the end of a wooden spoon into each cookie and recreate the well. If any of the dough sticks to the wooden spoon, just wipe it off. Try to compact the dough so the walls of the cookie are fairly thin. There are so many different styles of sombreros, so have fun decorating in any way you'd like! I started by piping some Betty Crocker Cookie Icing around the base of the sombrero crowns then I sprinkled on some Betty Crocker Decorating Decors Nonpareils. On some of the cookies I added some Betty Crocker Cupcake Gem Pearls to the edge of the brim and to others I piped on an squiggly line. You can be creative here and use your imagination in decorating. Anything goes, have fun! 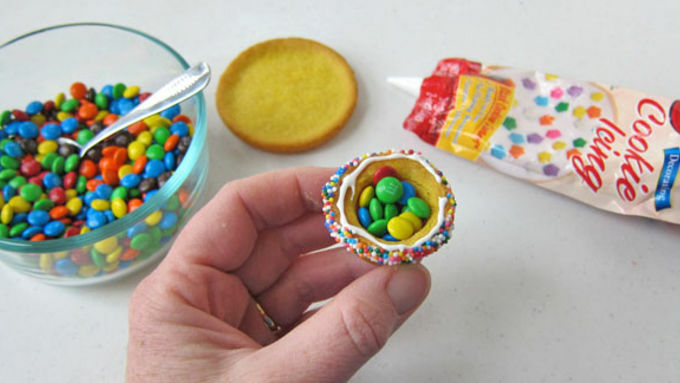 When you serve the cookies, everyone will be surprised to find candy hiding inside like tiny cute piñatas.